Another Vote – Another Disappointment? So there’s going to be another General Election. Maybe you’re not that excited. Maybe you’re still disappointed by the last one. In a democracy, you get choices. So you expect the people who made a different choice to be disappointed. But the great about democracy is that if you wanted something different, you can always keep putting another point of view, and there will always be another vote. Wanting to silence dissent or saying one vote counts for ever is sticking a knife in democracy. We’ve had two really big votes in two years, the General Election, then the referendum. Now we’re to have another one, think about something that’s strange about them. It’s not just the losers who’ve been disappointed. Even the winners aren’t happy. What happened? At least usually if you voted for the winning party, you’re satisfied for a bit. And the winning party’s quite happy for a bit. Well, it didn’t happen this time. Even though most people voted against them, two years ago the Conservatives won by that much. But they’ve been behaving as if they rule the world ever since. That’s disappointed a lot of people who voted for them last time. Because a lot of people said they liked David Cameron. He seemed like a moderate and not the nasty, arrogant sort of Tory. And the Conservative Party promised that voting Tory meant two things above all: stable government and economic success. That’s all gone, never to return. Literally the day after the last election, they shut down support from disabled people getting into work. Just because they could. Nasty. All the way up to today, with the Tories hell-bent on inflicting the most damaging hard Brexit they can. Arrogant. In between, they’ve messed around with our schools. They put the NHS in crisis. Because their far right hate the environment, they’ve cut green energy so the Tories went from hugging a husky to tilting at windmills. But above all, this Tory Government has meant utter political chaos and instability, and economic disaster. The worst of it’s in one word: Brexit. First the Prime Minister went. Then none of them had a clue what happened next. But they’re still behaving as if they rule little England. 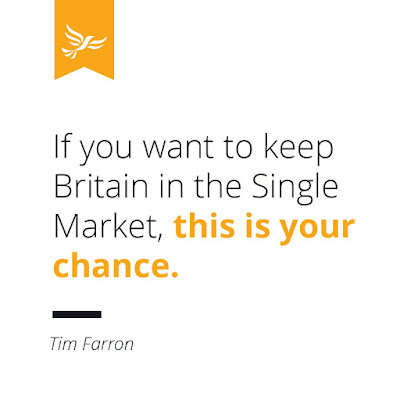 Now inflation’s rising, jobs are falling, companies are moving out of Britain, they’re throwing away the biggest Single Market in the history of the world. And Britain is getting smaller, meaner and nastier. A terrible disappointment to everyone who believes in British values. And still no-one has a clue what happens next. I bet one person does. Because in Britain we have General Elections every five years. 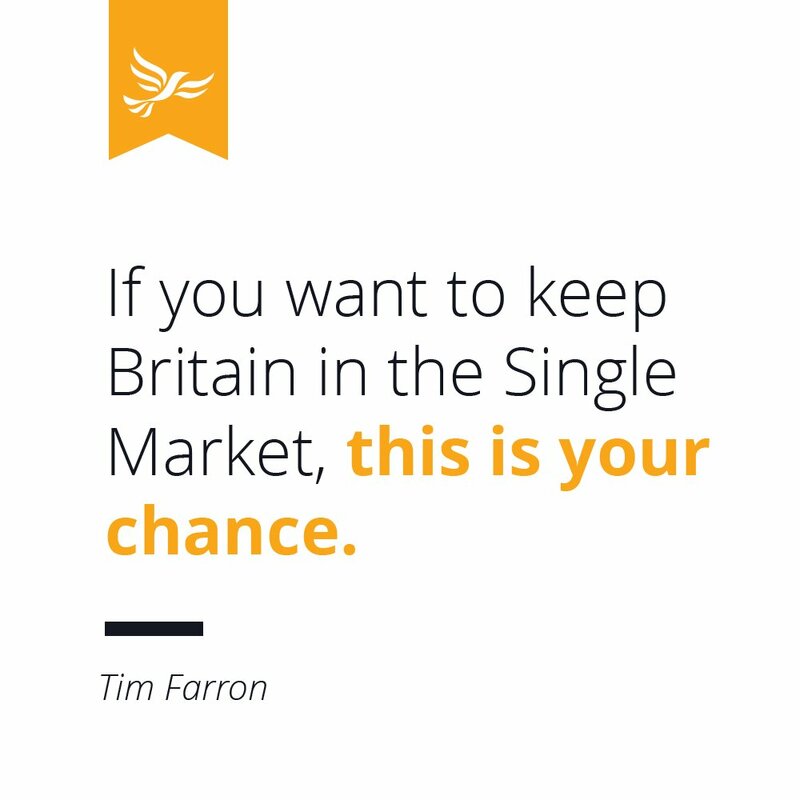 The only reason not to is if a weak Prime Minister is in a total panic and does a massive U-turn. Theresa May has called an election before it’s even half-way time. It must be because she’s panicking. She’s seen some secret figures of how bad it’s going to be and is making a run for it before total disaster. The most unstable government in decades. The economy thrown in the bin. Now there’s only chaos. Mayhem. What can the Tories say to the voters they’ve let down? All the Tories stand for now is hating foreigners and bossing people about. And it’s not just Tory voters who are disappointed. Tory MPs have actually resigned from Parliament and left politics because they’re so fed up. Even David Cameron did it! How much of a disappointment do you have to be for the guy who’s just been Prime Minister to say, that’s it, I’m sodding off? And since the local elections a year ago, in the by-elections every week where people vote for new councillors – the Tories have lost 21. They must be disappointed with that. Now, I’ve never been a Labour supporter either. But even I can see that you need a strong opposition to hold the Government to account when they’re in such a mess. Well, there’s no such luck. If you voted Labour last time, well, you’d have been very disappointed they didn’t get in. But they failed by a mile. And since then, they’ve just got worse. The one reason the Tories look like grown-ups after all their Mayhem is – the Labour Party. Corbyn and Labour MPs and members who are even more at war with each other than the Tories are. When the country really needs someone to force the Tories to account, all you’re getting is the worst opposition in living memory, who are only interested in fighting themselves. But the thing that’s really disappointed people is the one you’d never expect. The most far left Labour leader ever votes with the Tories on everything – he’s given the Tories a blank cheque to do whatever they want on Brexit in every single vote in Parliament. And Labour are boasting they want a harder Brexit than the Tories. A harder Brexit than UKIP! So there are Labour MPs who’ve resigned from Parliament too, and left politics too, because they’re so disappointed. And since the local elections a year ago, in the by-elections every week where people vote for new councillors – Labour have lost 13. What a disappointment for what a let-down of an opposition. Then there’s UKIP. At the last election they got one MP. Just one MP. He’s left the party because they all spent so much time fighting him. Since they got their dream result in the referendum they’ve gone through four leaders. One of them twice. 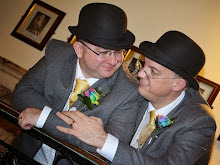 All they ever had was hate, and now they’ve got no-one else to hate but each other. They’re just falling apart. No MPs. Very few councillors. And you can guess what’s been happening since the local elections a year ago, in the by-elections every week where people vote for new councillors – they’ve lost another 7, probably all they were defending. They must be disappointed with that. But nobody’s even paying any attention any more. And then there’s the Liberal Democrats. Everybody knows at the last General Election we had a terrible result. The worst since I’ve been alive. We all worked hard, we were all disappointed, and our voters were disappointed. But that’s not where it finishes. 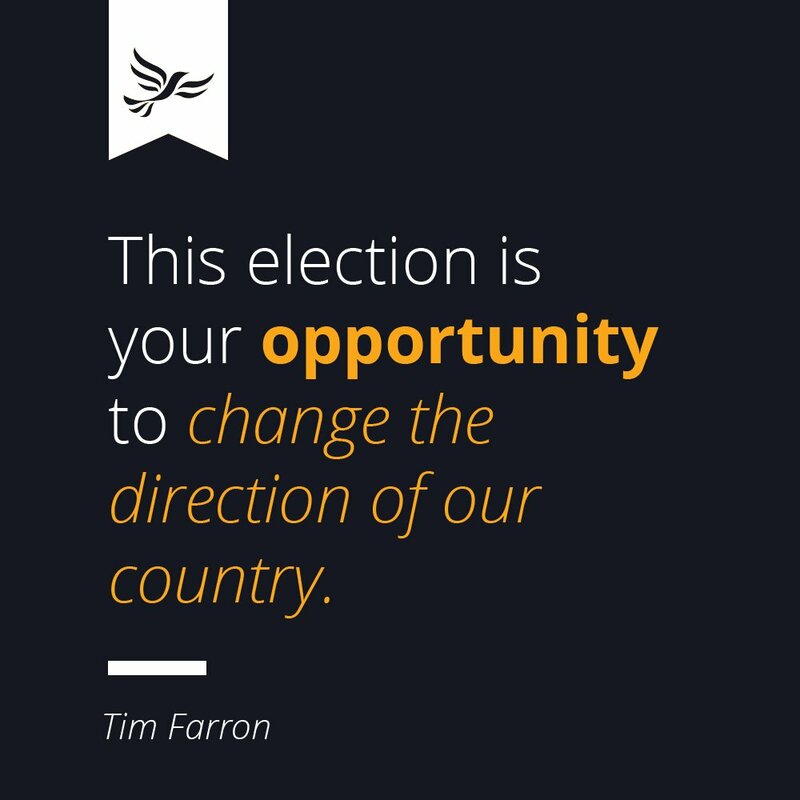 Two years ago we had over forty thousand people still working hard as Lib Dem members. And we didn’t give up. Within a week of the last election, we had more than fifty thousand members. And still more people joined. And when the referendum went Leave by that much, more people joined. By a couple of weeks ago we’d doubled our membership to eighty-five thousand. On the day Theresa May panicked and ran for an election, Lib Dems surged to more than ninety thousand members. We’re still growing every day. Because Britain is better than this, and there is only one party that is fighting against the disappointment. Because standing up for a better future inspires people. Being a proper opposition. Standing up for working together. For trade and peace and prosperity and the environment and education and our NHS. And our MPs have actually gone up instead of quitting. One of those brand-new Lib Dem members was determined to make a difference, and she did. She won voters over and overturned a huge Tory majority when she was elected MP for Richmond Park in December. 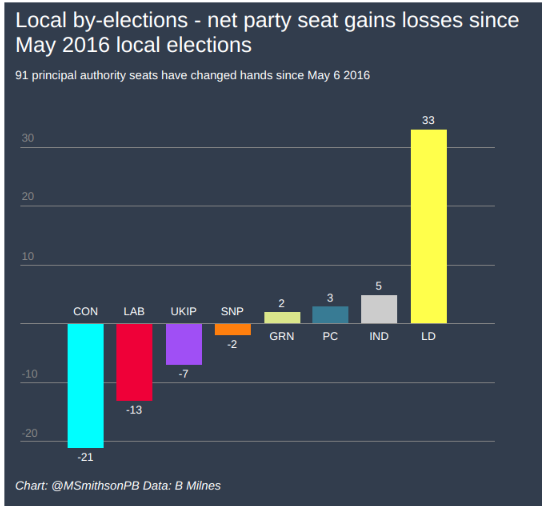 And since the local elections a year ago, in the by-elections every week where people vote for new councillors – Tories down 21, Labour down 13, UKIP down 7. People have voted in 33 new Lib Dem councillors. You do have a choice. You can change direction. You don’t have to live with disappointment. We’re in league with the future. Join us. 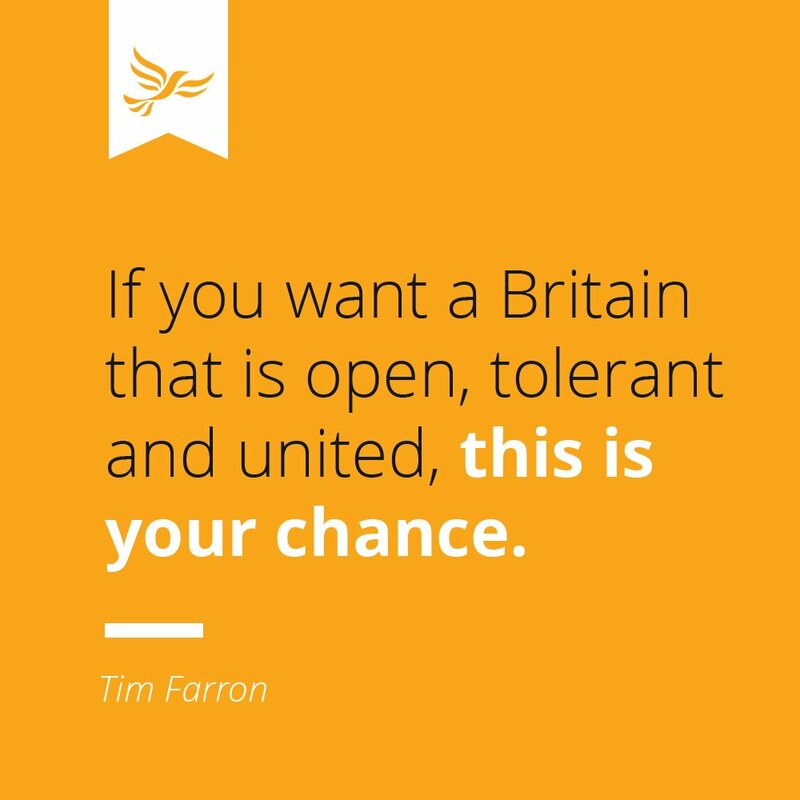 If you want the choice to stop Brexit, if you want Britain to be the open, tolerant, outward-looking country we can be proud of again, if you believe in freedom, fairness and a better future, join the Liberal Democrats. Theresa May has called a panic election at a time she thinks is best for her to fix the result. But we have a choice. Mrs Mayhem – prepare to be disappointed.